You press play on Week 603 (as you do each and every week, right?). The second song comes on and you would be forgiven if you thought it was a “Long, Lost Zeppelin” tune just released in a new boxset. Actually, the Led Zeppelin feeling doesn’t come in until the SCREAM at the 10 second mark and the vocals make you wonder if Robert Plant can magically inhabit other lead singers. Well, just this one. The opening guitar riff had me thinking of The Black Crowes. So yes, Chris Bro a happy boy. They are from a small town in Michigan. Population of 5,000. Gotta love those Midwest boys. 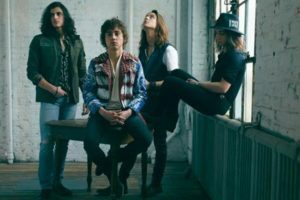 GVF are the Kiszka brothers Sam (bass), Jake (guitar) and his twin Josh (vocals) plus high school buddy Danny Wagner (drums). Plus, they named their band after a local, elder musician. How bloody cool are these kids? Holy balls. That scream. Just brilliant. There is a reason I’ve said “Live music is good for your soul.” The future is bright. Rock is dead…long live rock. They are young and hopefully will learn a bit of stage presence. Not a bad time to throw this interview out there. It’s Bonham and Plant chatting up the BBC. Older Song of the Day. Derek James. Brilliant person. Great musician. Love that his new band is making waves and hanging out with Sting. I still feel that this song should have been huge. Or at least big. What say you?